As our favorite tradition, Team Fidelitas enjoyed two days of education on Red Mountain this week for our annual staff retreat. 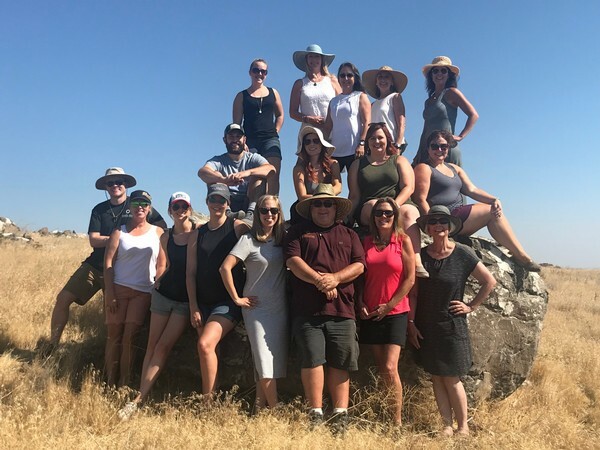 We trekked the vineyards in 100 degree weather, took an in depth look at the impact of small lot fermintation, toured Inland Desert Nursery...and of course, had lots of fun times and great food and wine in between. Stay tuned for some of our favorite take-aways! Every July we celebrate Team Fidelitas Month to say, Thank you to our Wine Club Members. We always brainstorm new ways to add value to the benefits we offer our members. Fidelitas Optu and Magna Wine Clubs are invited to join us for a preview of wines slated for release in the second half of 2018. It’s one of the many benefits we offer our Wine Club Members. Charlie creates each wine with our wine club in mind and this is the perfect event for our Optu and Magna members to taste the wines before they are even released, so they can make an educated decision for their fall allocations. Below is a list of which wines will be available for tasting. The Preview Tasting event is an invitation only event for our Optu and Magna members who will have the first opportunity to select their club allocation. If you are a current Faithful, Loyal True member and want to upgrade your membership, our Wine Club Team is happy to help with that. Or, if you are a current club member and unable to attend our preview event, not to worry as a member you can pre-order any of the wines above at any point during the year. Contact our Wine Club Team if you have questions, they’d love to hear from you! Fidelitas is faithful, loyal, and true to our members. This July, during Team Fidelitas month, we'd like to say THANK YOU for being true to us. Current members let us know about your experiences as a Fidelitas Club member. TAKE THE SURVEY. Are you a Fidelitas fan but not a member yet? TAKE THIS SURVEY to let us know how we're doing and what you'd like to see from us. All survey respondents will receive a code for special pricing on their next order, and be entered into a drawing for a Team Fidelitas swag bag, including a t-shirt, wine opener, and water bottle. Members invite your friends to join the Fidelitas Wine Club to receive a $25 referral credit and have the added bonus of hanging out with your friends at upcoming summer tastings and events. 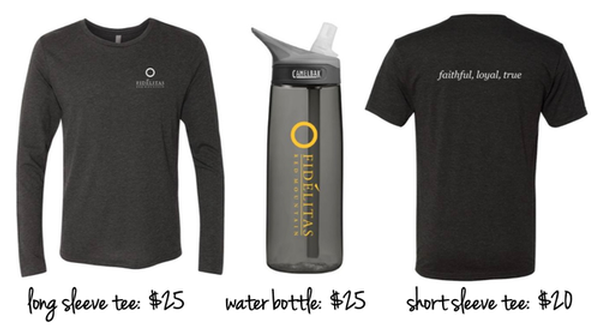 We have a limited number of 2018 Team Fidelitas t-shirts and water bottles available!